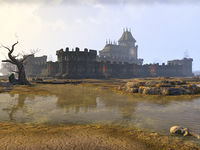 Blue Road Keep is a keep in central Cyrodiil, east of the Imperial City. It is initially controlled by the Ebonheart Pact. It is connected via the Transitus Network to Arrius Keep, Chalman Keep, and Sejanus Outpost. Only the Pact can use the fourth Transitus link to Drakelowe Keep. It is one of the six keeps an Alliance must control in order to crown an Emperor from their own. It is surrounded by volcanic hot springs. Nothing remains of Blue Road Keep or the hot springs by the time of Oblivion, but the Blue Road itself still runs between the Imperial City and Cheydinhal.